Transylvania 1994, the Griffin returns. The first Transylvania had taken just over two years from the first ideas to the event itself, we decided to hold the next Convention two years after the first, again as near to Halloween as possible. It was obvious that we would require a larger venue than 1992 as the hotel was bursting at the seams at our first event. We also wanted to find a venue that could show the film as well as stage the 'day' section of the event. Andre Willie, our head technician (and all round nice guy) suggested the Novotel Hotel, Hammersmith so we went to check it out. The Hotel was all we needed, a huge Convention area with the space to set up a huge screen and projection facilities. There was also space for a dealers room and it even had a bar in the Convention area! Once again the committee could not have run the event without the invaluable help of our wonderful technical crew, efficient Convention staff and speedy Go-Fers. Special thanks to Davy and Barbara Orr who flew over early to help the rest of us as we hit the usual last week panic of envelope stuffing, merchandise chasing (some of it arrived on the day itself!) and Guest liaison. We had room for over six hundred people at the 1994 event and as in 1992 the event sold out weeks before the day itself, with a lot of attendees taking up the offer to buy cheaper tickets if they booked early. Many of the attendees at 1994 had also been at the 1992 Convention so they had an idea of what to expect. It was decided to try to schedule the Guests a little better than in 1992, but as always with these things we ended up having to swap round some of our planed times. The wonderful Patricia Quinn, who was touring in the Stage Show at the time of the Convention brought along some of the other members of the cast and they kindly agreed to go on stage and take part is some question and answer sessions and autograph signings. This was especially appreciated as we knew that they had to be performing on stage in the Rocky Horror Show that very evening! We also decided to have two hosts for the 1994 Convention rather than spread the day out amongst the whole committee, this also freed Nik's time to be the Stage Manager for the whole event. Steven Edwards and David Freeman (that's me!) were chosen to be the dynamic duo in question, we were however to be joined by a third host on the day. Steven had brought a glove puppet with him for some unexplained reason and during one of our more inspired ad-libs we christened it 'Anchor' as in anchor man. The audience were given instructions to shout a greeting every time the puppet appeared. This of course caused some confusion for a couple of our Guests when the puppet appeared through part of the stage behind their back and six hundred people shouted "Hello Anchor!" Once again the day proved to be a great success with fans from around the world meeting in their appreciation of that spark of life that we call Rocky Horror. Once again the event finished around three in the morning, seventeen hours after the day started. This time however Stephanie and myself (and also Davy and Barbara) had something other than a Convention planned for 1996, by the time the 1999 Convention came around the kids were each aged three. The Programme for the Transylvania Convention was again divided into two sections. As in 1992 we had a day section of Guest Interviews, Autograph signings, Competitions and Costume Contests, the Dealers Room for merchandise and an alternate programme of movies with a Rocky Horror connection running throughout the day, this time with the videos projected onto a fifty foot screen. Because we were in a much larger venue we were able to build a set for the Convention. 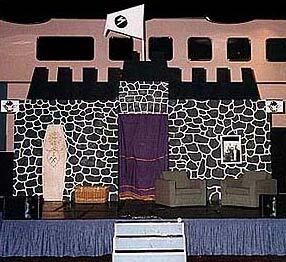 The set was constructed and painted in central London and then dismantled and reassembled at the Novotel Hotel. Alas it is no more, because of fire regulations we had to paint it with a flame resistant coating. On the plus side this meant it wouldn't burn, on the minus side the coating used tends to rot through the wood within a month or two. After the Convention we dumped the set, where it was promptly removed by a local boy-scout group as fire wood for their Guy Fawkes night bonfire! They're probably still trying to light it. As well as our Guests, alternate film showings and Costume Competitions we also decided to play a few impromptu party games as the day progressed. Of course in best Rocky Horror tradition we decided to try and ensure the games involved the audience as much as possible. The Rocky Horror version of pass-the-parcel went down particularly well due to the fact that when the music stopped whoever had the parcel had to remove a layer of the wrapping and a layer of their clothing as well! If we do this again we'll make sure boas don't count as a layer of clothing. Steven was responsible for the spoon-and-string game, I take no responsibility at all, it was all his doing, honest. For those of you who don't know this game, it involves two teams of as many people as possible. They stand in two rows and race to see which team can thread a spoon with a long length of string attached down the inside of the first persons clothes, up the inside of the next persons clothes, etc. Steven had of course kept the spoons and string in the coldest place he could find, he also decided to call for the lunch break just as the teams finished threading forty people with string. As always we held our quiz game: Get your Rocks Off testing out two teams on their Rocky Horror knowledge, as usual the audience managed to answer more of the questions than the contestants, unfortunately we didn't have six hundred prizes to give out so we disqualified anyone not actually on the stage. The Convention paused for an hour at 11.00pm for people to get changed and ready for the film showing. As the main rooms were cleared we opened up the dividing doors between the main area and alternate video room, turned round hundreds of chairs and transformed the venue into a cinema. As our attendees were ushered back into the room, the stage set curtains opened up to reveal the projection booth for the film. Our Guests at Transylvania '94 once more included members of the Original Rocky Horror Show Cast and Picture Show, several members of the U.K. touring production also called in to the event to answer some questions and sign hundreds of autographs. 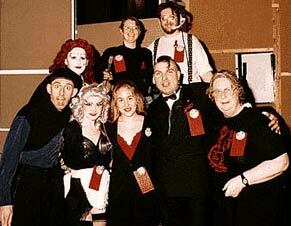 By popular demand, we also invited some of our 1992 guests to attend the 1994 Convention. Select a Guest from the alphabetical menu below for more information and excerpts from their question and answer sessions. David Freeman was behind the camera as usual and missed being in the group shot again! The driving force behind the Transylvania events, Stephanie wants everyone to have a good time at the Conventions and remember the day for years to come. She has recently had her application for Sainthood refused after her picture featuring the pointy bosoms (as modelled on the Kate O'Sullivan Magenta costume) caused an uprising at a very high level. It's me, the Man with a Plan, the Host with the Most, or to be super accurate the one that spent four hours the night before the event in the Casualty department of the local Hospital after a 80kg stage block landed on my left foot. Now you know why I had a limp throughout the day (I was thinking or re-phrasing that last sentence). Stage Manager for the 1994 event, suggester of useful ideas and detonator of special effects (well during the rehearsal anyway). Nik stated quite clearly after 1994 that 'he would do another Transylvania Convention when Hell freezes over'. And now a weather report for Hades on 30th October 1999: There will be snow and a one hundred percent chance of temperatures falling well below zero. Liz brought a little bit of sanity to the event, unfortunately she didn't unpack it and left it in her room for the whole day. Her help ensured things got done and was truly valued as was her ability to run round with a camera, blending in seamlessly with the events on-stage (if you were there you would have seen her quick flashes throughout the day). What can I say about this man, well on the day I managed to say quite a lot. Steven was my co-host for the event, bringing with him a wonderful sense of humour and also a huge basket of costumes (none of which had anything at all to do with the Rocky Horror Show). Without Steven's help many costume changes could have been averted. It was Jan Massie that was responsible for a large Duck entering the 'Other' section of the Costume Contest, something Steven had no idea was going to happen! After her appeal in the 1992 brochure, quote: Fun-loving 18 year old seeks willing transvestite to take me away from all this because I only got involved to meet Tim Curry and he isn't even here - bugger. Gillian was again conned into being a Committee member with the following phrase: 'Well to be honest, Tim hasn't said he wasn't going to attend this year'. Rosalind Monteath Rosalind (also known to many of you as Ros) valiantly womaned the Registrations desk for Transylvania '94, aided by the super-efficient Jan Massie. She also managed to explain to several slightly lost tourists exactly what was going on behind the closed doors of the Convention Area! Not strictly a Committee member in 1994, Davy was responsible for Security for the Convention. This involved planning the time of the Stewards and Go'Fers, making sure our Guests had enough alcohol privacy in the Green Room and helping the day to go smoothly. Davy also got to introduce several of the Guests and conduct their interview sessions.